What do you call it when Minnesota republicans and democrats together sell out their respective parties' core principles? In an astonishing public display of craven opportunism, toadying and corruption the Minnesota House of Representatives and then Senate bucked every opportunity to stand for that which they claim. Democrats, naturally, believe there is too much corporate welfare and "giving" away to the rich. There is much not to be believed in this. Republicans, equally naturally, believe in market forces and reduced government spending. Here too there is much not to be believed in. Yet at their fundamentals, this is indeed what both parties are and then some. The natural tension between the two defines our local, state and national politics. How was it then that we saw those members in each party who, apparently, are foolish enough to want to act on such principles, easily pushed aside and a toxic stadium bill passed in each chamber with room to spare? A Twitter account gave one a ringside seat to the brawl. MC could be mistaken but has there ever been this high a profile legislative issue in Minnesota history that was given such intimate scrutiny by the public, the media and the members in real time? Amendments to the bills were an adventure in policy discourse alone. Humor abounded, as did barbs and snipes. Local media, in MC's view, did an exceptional job in tweeting the facts, the corrections, the ups and downs in the process. Perhaps what was most fascinating about this sordid process was how the low rent politicians prevailed over the principled ones in both parties. It puts one in mind of that (relatively) famous Nora Ephron quote: "No matter how cynical I get, I just can't keep up." Time and again the implausible case was made that a many-times-over millionaire needed the taxpayer money of Minnesota. Concerns about the funding source of the state's share of the project were more or less dismissed out of hand. Gambling, that hideous thing, made numerous appearances in numerous Faustian guises. 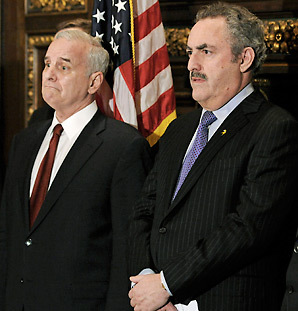 The DFL's Eddie Haskell, Rep. Ryan Weiner, er, Winkler flipped when his masters told him. MC gives him credit, though, for advancing the truly bogus notion that the give away of taxpayer's money to the already wealthy was for Minnesota's "quality of life" and not because of the economics of the deal. This must be akin to what liberals think of the Constitution's commerce clause: either a nuisance to be ignored or a concept stretched past the point of recognition. Either way no credibility is left. The creepy rent a mob known as the Welfare Rights Committee protests against Rep. Mary Franson but not this? Mark must have told Alida (or Carrie? has anyone seen those two together?) to keep them in check. The House debate was a debacle. Chaotic, venal and at times pathetic, those watching could only marvel. Interestingly, the pro-stadium types let only a few of their supporters talk, for which MC could be forgiven for thinking they'll be amply rewarded. The others were grinding the sausage. What was left of real conservative republicans in the House did their level best. So too did liberal democrats. At one point Sen. John Marty gave an impassioned, reasoned argument against the bill so sounding in GOP principles that those listening had to check to make sure the identity of the speaker. This is the political equivalent of an out of body experience. Particularly painful were the tweets of House caucus staff. MC understands they have to bleat out the leadership line but must they pretend to superiority while doing so? It only makes them look worse than they are, which takes some doing. MC also understands that "activists" are looked on by them with indifference at best and with scorn usually. That's ok; it would be cruel to wake them up. Oh, and can someone tell Chas Anderson that that Kurt Zellers rocket she was going to ride to the governorship? It ain't happening. Having been passed by the House, a similar but different bill was then take up by the Senate. It's no exaggeration to say that the Senate debate over the bill stunned even the most jaded, thereby exonerating by excess the heretofore thought of low point in Minnesota politics (or was that when Jesse Ventura was elected governor?). At any rate the discourse was so egregious MC suggested in a tweet that Sen. Geoff Michel be waterboarded. No apology will be forthcoming. Actually, others should be added to the list. In due course the mandate of Heaven was passed by a wholly owned senate that represented no one except those who had bought them off. When RINO's, liberal democrats, Ron Paul supporters and other flavors of both parties are in agreement, something genuine is occurring. That occurrence is the selling out of principles; real, genuine principles. Not every vote, not every issue, invokes those principles in the way the vote on the Vikings stadium did. But that vote did. We have been tested and we have been found wanting. Perversely for republicans, a majority of the vote in both the House & Senate were democrats. As Sen. Dave Thompson (who has taken a few whacks from MC) tweeted: Who is the majority party? Indeed, Senator. Credit where due though he had the support of others who are well known if you have been following the battle. He was hardly alone. Pro-tip Dave? Don't give media interviews as if you were. Enter Nick Coleman, who weighed in with an exceptional J'accuse. It can be read by clicking here. If you're reading this post, you must read it as well. MC doesn't agree with all of it but that's not the point. The point is that MC and many, many other republicans do in point of fact agree with it. To his credit, Coleman on Twitter heaped praise upon those republicans who stood true to their principles. As MC does to the John Marty's of Nick's party. Coleman & MC are now following each other on Twitter. Sen. Gretchen Hoffman, who gives hope to those of us who believe in leadership, tweeted that the Senate debate was so much "bread and circuses." That was enough for Sen. Julie Rosen, our Medea when it comes to republican principles. Photos show her in victory as buffoonish as the buffoons with whom she poses. DFL Eddie Haskell's manufactured quote that this is about Minnesota's quality of life ("Robin Hood in reverse" as Ralph Nader called it), is endlessly telling. Don't look to him to understand it though. Robots only know their programs. Instead, those who thought this would improve the state in which we live are deluded. What the supporters of this stadium bill have delivered unto us is not Minnesota but Illinois. The worst of it is that they don't even know it. But we do and for now that must suffice. This post is dedicated to Susan Closmore. Time For The Independent Republican Party?